When organizations engage with their constituents – especially the people who are intended to benefit from social change – they cultivate Constituent Voice™. Our approach uses tested measures of client satisfaction to forecast when outcomes are likely to improve. 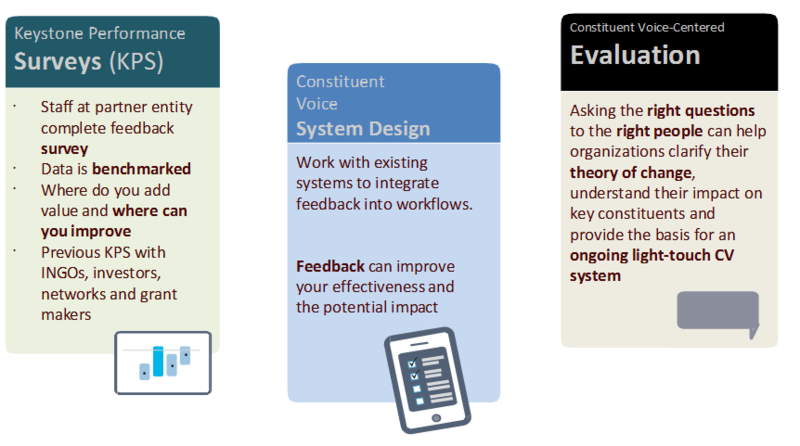 Generate evidence to validate your organization’s theory of change and validate your impact strategy. Learn how to integrate feedback into your internal management workflow and measures of performance. Learn from your constituents and improve your effectiveness. Generating insights tied to actionable responses. Want to learn more? Look at our Constituent Voice tutorial.